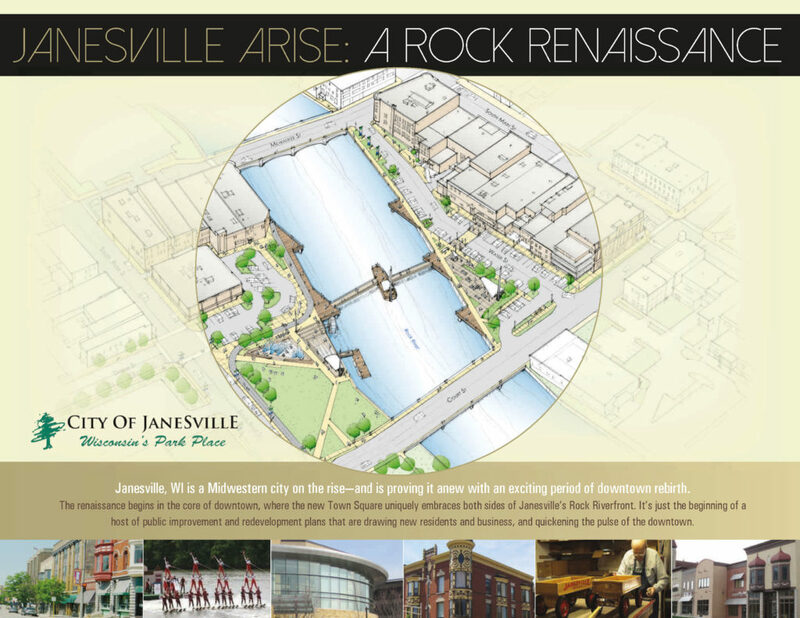 Ribbon cuttings in Janesville Town Square; new water feature needs a name | Vandewalle & Associates, Inc.
Part of the ARISE downtown renewal plan, elements of Janesville’s new river-centric Town Square and downtown redevelopment are officially openig to the public. On September 12 a ribbon cutting took place for the new J.P. Cullen Memorial Pavilion, a low, concrete, roofed stage. A second ribbon-cutting honored the donors who made the new Interactive Water Feature or “IWF” possible. 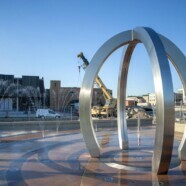 Lest it end up being called the “IWF” forever, Janesville officials explain that they are still searching for a name for its new water feature in the downtown riverfront Town Square. Meanwhile members of the community young and old are getting their first experiences with the water-themed artwork which features timed sprays of water illuminated by colored lights and music. Oct. 26 is the target date for the next ribbon cutting ceremony, celebrating the re-opening of the revamped River Street. Entitled “Fun on Festival Street” the event will include food trucks, beer vendors, and live music. Vandewalle & Associates assisted the public-private ARISE team with design of the Town Square public space and helped with obtaining funding.